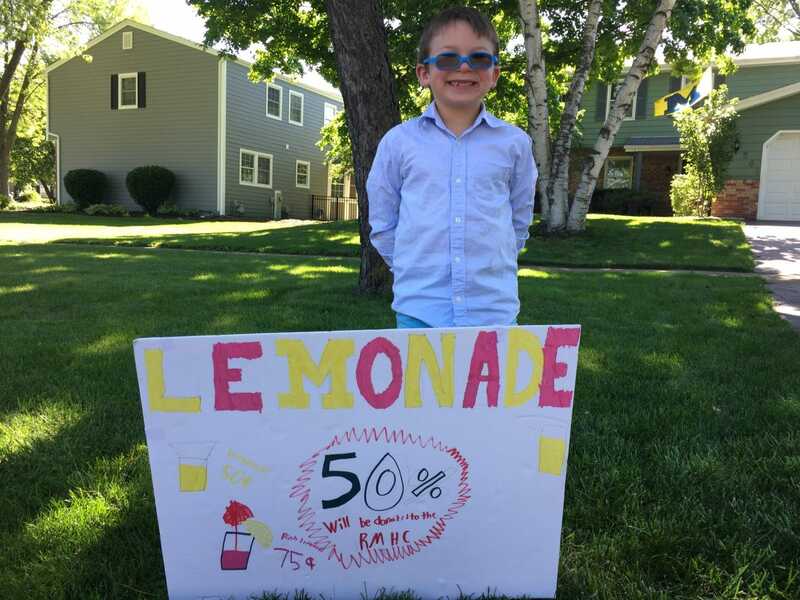 My 7-year old has wanted to run a lemonade stand for at least a year or two and he finally got his wish after receiving some essentials like a cash box, lemonade mix, beverage dispenser and paper cups for his birthday from some of his thoughtful friends. The weather was perfect at low 80s with clear blue skies and we made regular and pink lemonade, keeping with ice separate so as not to water it down. Our driveway is a great location as it’s a high traffic area and we are within throwing distance of a park with a play structure. We also have perfect shade in the afternoon thanks to the sun positioning and a few large trees, so the product, the workers (my kids and I), and customers don’t get overheated. We made a quick FB Live video where he shared what he was doing, how much he was selling the product for, and our location. We posted it and then his natural salesman abilities kicked in. If you haven’t had the pleasure of seeing Cole in action, he goes all in. He shouts out loud, shows his pride for his product, does a dance to grab the attention of cars going by (much faster than the posted speed limit, a topic for another day), and greets his customers by asking which flavor they’d like and if they knew he was donating 50% of the sales to the Ronald McDonald House Charities. He’s a lovable little dude, especially with his blue glasses, and current smile that is missing his two front teeth. He even dressed the part and put on what he calls his handsome shirt (collar, button-down). His first custo mer was the mail lady. He offered her a free one, since she was part of the process of delivering a letter to his friend. She was adamant about paying, and even gave a little extra when she heard about RMHC. Cole told me that the reason he chose RMHC is because when he went to Texas earlier this year with my mom, he really missed me a lot. RMHC helps keep families together by providing rooms and meals to the family while kids receive the much needed medical attention, so that’s why RMHC is important to him. Melts your heart, right? When he started to feel sad because cars weren’t stopping, I told him to just smile and wave, since it’s important to be friendly and always make your customers feel welcome. Sometimes we had friends stop by who wanted in on the action. Maybe they hadn’t thought of having their own lemonade stands before, but now that it was up and running, they saw an opportunity to help. Some customers stopped because they knew us, others stopped because it reminded them of their childhood entrepreneur adventures. One man told us he turned around up the street because he heard how hard Cole was working (shouting) and wanted to reward his efforts. As the afternoon progressed, the lemonade disco dance emerged. Apparently, I should credit this to Fortnite, which my kids don’t play, but have learned about it from everyone else. Operations began to run smoother as processes emerged. The boys now understood how to handle cups (not grabbing the cup with fingers on the inside), how much ice to scoop using the scooper, how to turn the dispenser so that liquid flows and stops as needed (without wasting through drips or overflows), how high we should fill the cup, and of course, the importance of keeping the till closed so that money doesn’t blow away. Lastly, there were some finer communication points that were taught, such as, don’t brag about how much you’ve sold, stay positive and share that business has been good, or that we’ve raised a lot of money for RMHC. Also, let the customer decide if they want to donate more, specifically, listen and say thanks if they tell you to keep the change, instead of aggressively asking “do you want your change?” If they decide to donate extra, it’s okay to fill up their cup a little more. After about 2.25 hours, the complaining started creeping in. They were done. I was able to convince them to stay open another 30 minutes or so, to catch the pre-dinner rush hour traffic. We did get more sales, including one of their babysitters, but it may not have been worth the extra time. They are learning first-hand about prime lemonade selling hours and customer behavior. They (and I) are learning about their limits. Share your mission. Help people understand why this is important to you. Provide a variety of products at different price points. The product needs to fill a customer’s pain point: refreshing lemonade on a warm summer day. Give back. Philanthropy is awesome and makes people feel good. Always choose pono. Customers are people that want to connect with your business on many levels: nostalgic, support, charity, comfort. Cuteness doesn’t hurt (uncertain how sustainable this strategy is!). As for results? In their first day, they made a donation of $21 to RMHC who was tickled pink when we told them about Cole’s and Charlie’s efforts. I’m teaching them about COGS, sourcing supplies (amazon isn’t always the best price), and making lemonade from scratch vs. powdered mix. We will be learning about flavor variety, and we will see how that impacts costs, price, and customer satisfaction. We will also learn about brand awareness, brand equity, and effective marketing. It’s going to be a hot summer, so be sure to stop by! If you want to get your business ahead, drop me a note at alexis@marketingmanallc.com or fill out the form below and we can set up a free 45 minute consultation to discuss your customers, marketing goals and challenges.